Jimmy Mullen and Anthony Wall share a one-stroke lead at halfway in the Alfred Dunhill Links Championship. 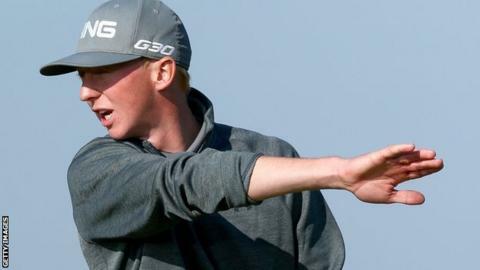 Mullen, who is making his professional debut, added a three-under-par 69 at St Andrews to his opening 64 at Kingsbarns to finish on 11 under. His fellow Englishman Wall, 40, shot a four-under par 68 with seven birdies and three bogeys. "I can't really explain it. I'm just out there trying to enjoy it and learn really," said Mullen, 21. "I'm still a bit like, there's Martin Kaymer and other people like that." Ireland's Paul Dunne, Welshman Jamie Donaldson, Denmark's Thorbjorn Olesen and American Chris Stroud are all tied for third, one shot behind the leaders. Defending champion Oliver Wilson could only card a second consecutive 74 to be four over after two rounds. The Alfred Dunhill tournament sees fourballs made up of two professionals and two amateur players, alternate between links courses at Kingsbarns, Carnoustie and the Old Course, St Andrews.